We got out to the fair this morning at about 11:00am after a nice stroll through town. As per usual it was bustling with children’s book lovers from all over the world. 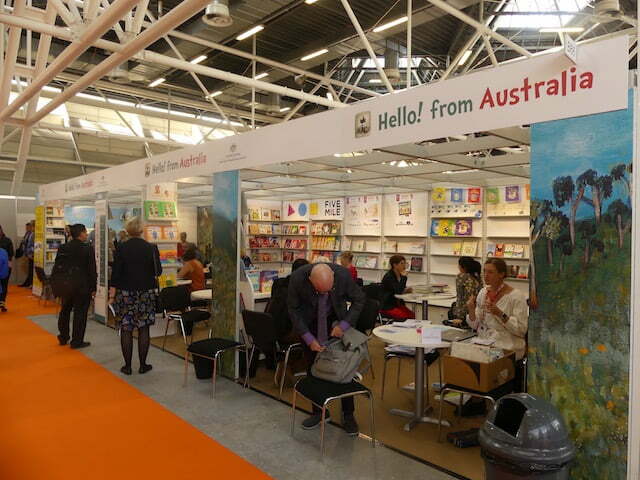 Firstly made our way the the HELLO FROM AUSTRALIA stand and said G’day to Ann James, and Anna Solding from MidnightSun Publishing. Papa Sky and One Step at a Time are on display at this stand, and around the corner at the Hardie Grant stand The Man with Small Hair is on display. 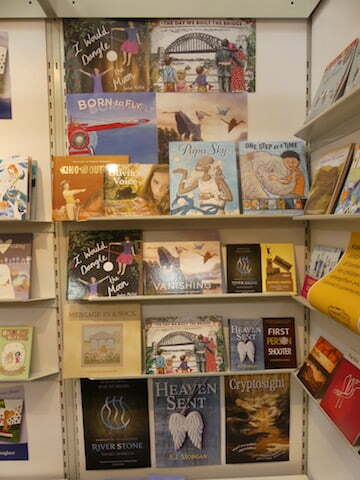 Then began the best part of all…strolling past thousands of children’s books from all over the world. I particularly love the Eastern European books. They just have something else that is hard to put your finger on. The Oz stand, with Rights’ meetings happening. MidnightSun publishing has its own little corner. Oh look what I see! It’s Papa Sky and One Step at a Time! Now if you are looking for an illustrator there are thousands who have put their business cards up on these boards. I met a guy from Turkey, Ceyun Sen, whose work is magnificent. Look him up. 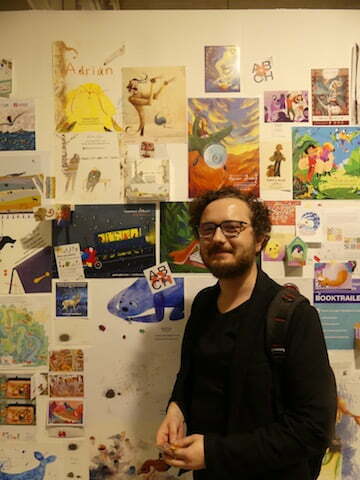 Look above his head to the left at the image of a man with curly hair and a moustache…that is Ceyhun’s work. 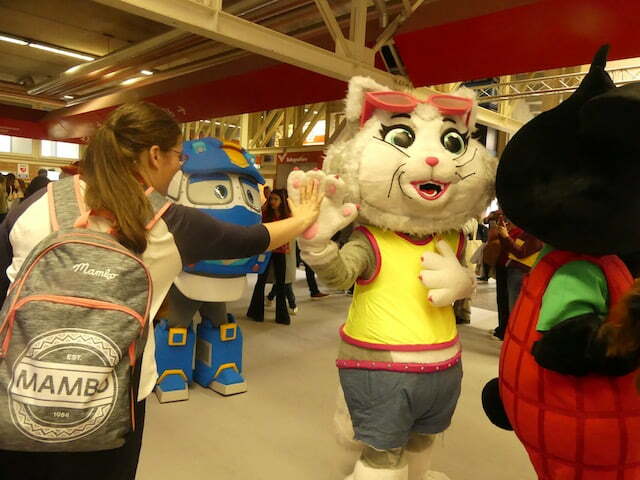 Mia was lucky enough to get a high five from this cat during the costume parade. 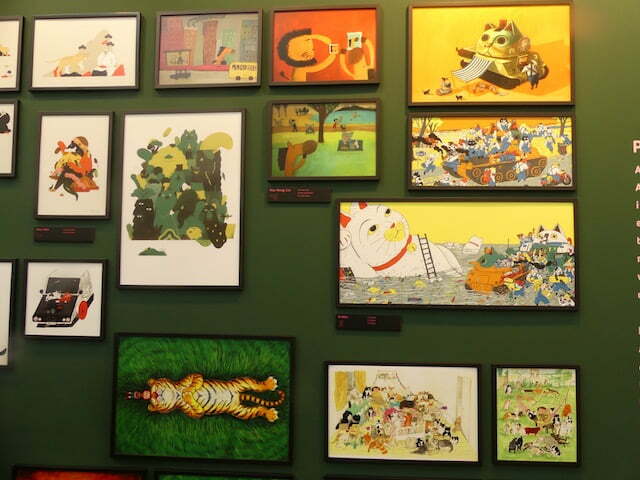 Walked through the Behind the Mountain in Taiwan stall and their theme this year is animals. This photo is just a small sample of what was on display. Gorgeous. There is so much talent in the world. So today is Day 2. We are heading in later on and will be going to the Australia party at the stand and then out for a meal with fellow authors, illustrators , publishers etc. I just love seeing posts from Bologna. Thanks for these and keep them coming! Have great time. Are the gelato and pizza as good as what I think? This is Room 6 here. We have some questions for you. Thanks Kaye. Once again the fair is amazing…so many people…so many books!And of course Italy is fantastic! Hi there Room 6. Good to see you are following my blog. A little village called Vernazza on the Cinque Terra has been my favourite place so far. It is built on the side of a cliff and there are a thousand steps and stairs to climb but the views are spectacular. My favourite pizza so far has been spicy pepperoni and my favourite gelato flavour is a toss up between chocolate and coconut. But the other day I had two flavours in the one cone…chocolate and liquorice and it was like eating a chocolate bullet lolly! Yes the ‘drawers’ are for the bodies at the cemetery.Last night at the Book Fair Morris Gleitzman gave a speech and it was very good.Ciao bellas!